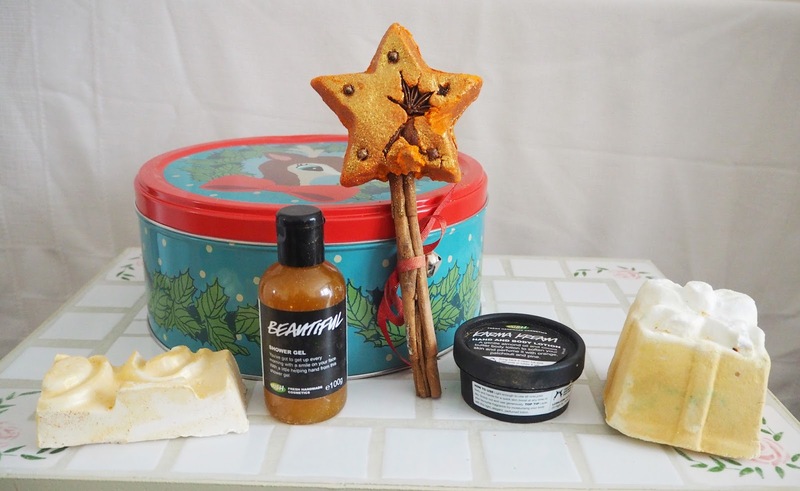 Here we are, as promised, my Lush haul from the festive season! These products were mostly given to me as gifts however some of the sets I managed to nab myself in the madness that was the online Boxing Day sale!! I actually ended up making order the day after as the whole site completely crashed for the majority of Boxing Day. I love how lush has such a cult following! They are undoubtedly the photos I get the most comments on on my Instagram, along with all my candle ones! Unfortunately a lot of these products are only brought out for the festive season and won't be available in store again until next Christmas however I still wanted to share this with you all as I was so excited with what I got! 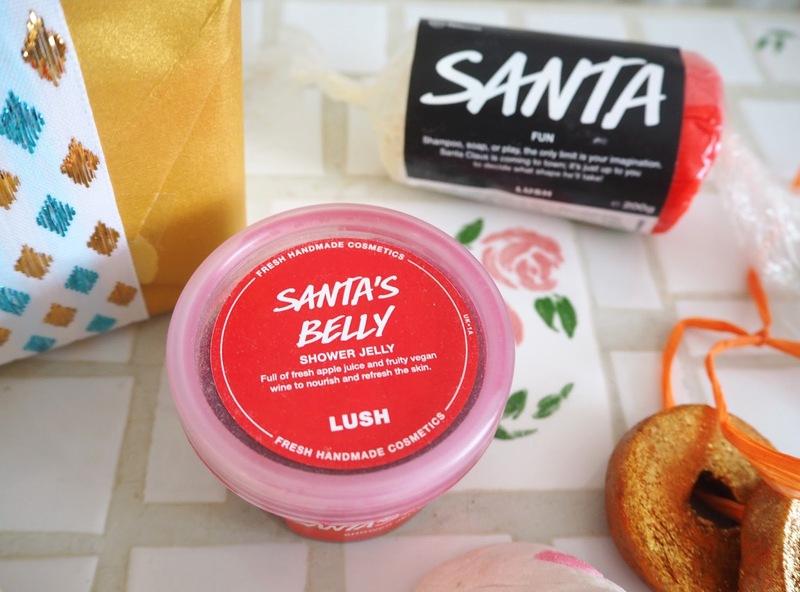 Santa's Belly Shower Jelly | This feels like actual jelly and smells incredible like apple juice! It has tiny little stars laced through it and is designed to be used in the shower as a shower gel. 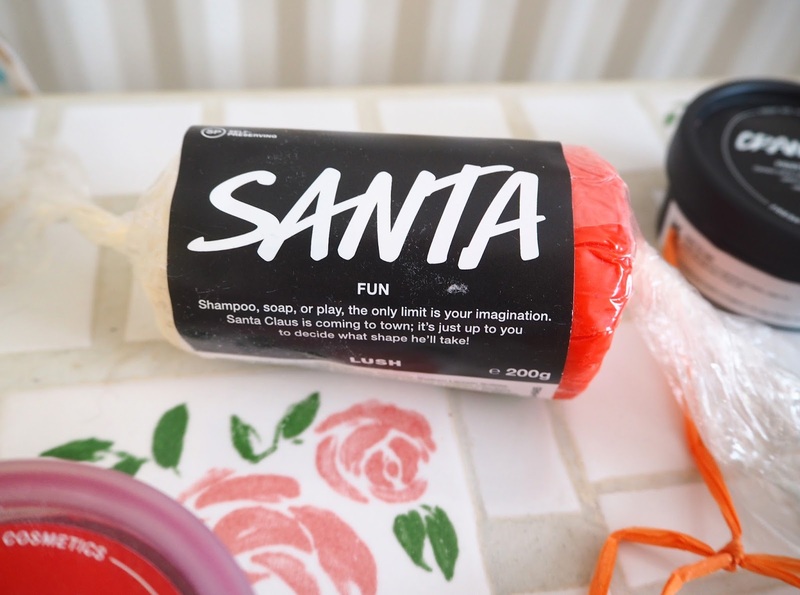 Santa Fun | This is pretty cool versatile stuff, you can pinch bits of this off to use as shampoo or body wash or you can use it like play dough to have "fun" and create shapes ie. A little Santa! This one is fragranced with jasmine and ylang ylang. Candy Mountain Bubble Bar | A sweet candy scented bubble bar with shimmering stripes of pink and white. The best thing about bubble bars is that you don't have to use them all at once you can crumble as little or as much as you like under the tap. Cranberry Face Mask | I have totally fallen in love with this face mask and am gutted that it's only a limited edition for Christmas! Not only does it so smell incredible I could eat it but it leaves my face feeling super soft after I've removed it. The base is Rose Clay with real pieces of antioxidant Cranberry, restorative Argan Oil and Fresh Fennel. I managed to get approximately 8-9 uses out of it which I thought was pretty good. As its a fresh face mask it's recommended that you use it within 3 weeks and store it in the fridge. After using this I am a total convert to Lush face masks and can't wait to try more! If anyone has any particular ones they could recommend me then let me know in the comments below. Pop in the Bath Bubble Bar | This pretty bubble bar is from Lush's regular range and is described as "practically perfect in every way" - a floral bar with bergamot, lemon, orange and mandarin oils. 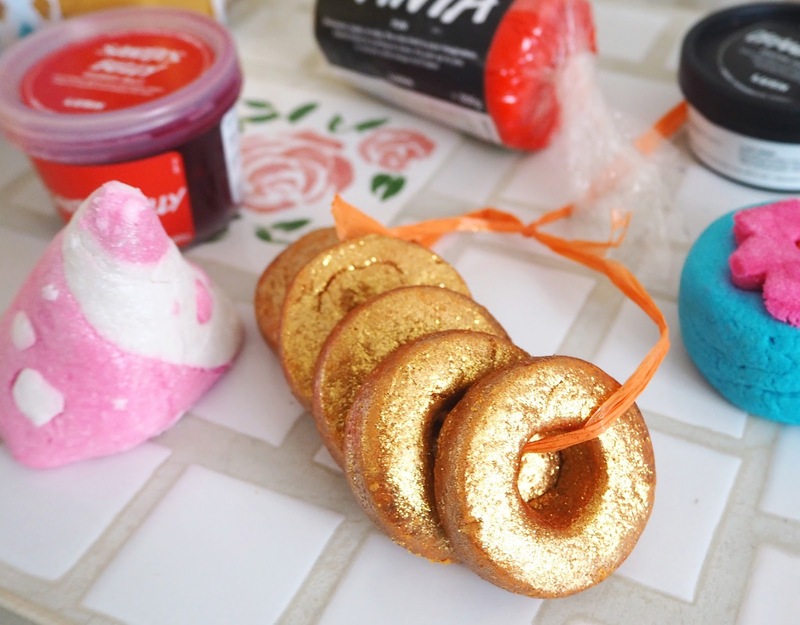 Five Gold Rings Bubble Bars | How cool do these look? And they really make me want to sing the 12 days of Christmas! 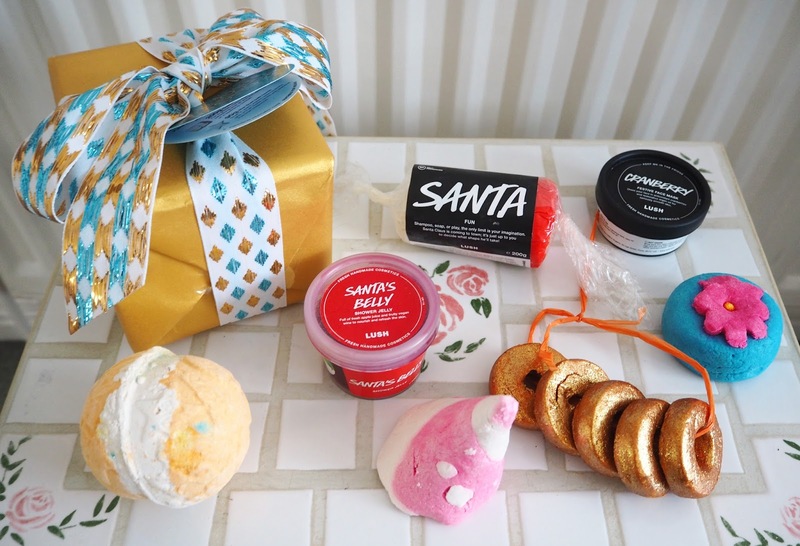 They are scented with vanilla and tonka beans, and the best part is that you can get five baths out of them by crumbling each one separately under a running tap to create a mountain of bubbles! Yog Nog Bath Bomb | This massive bath bomb smells the most festive out of all of the ones I got I think. Cinder toffee with spicy clove and ylang ylang - delicious! 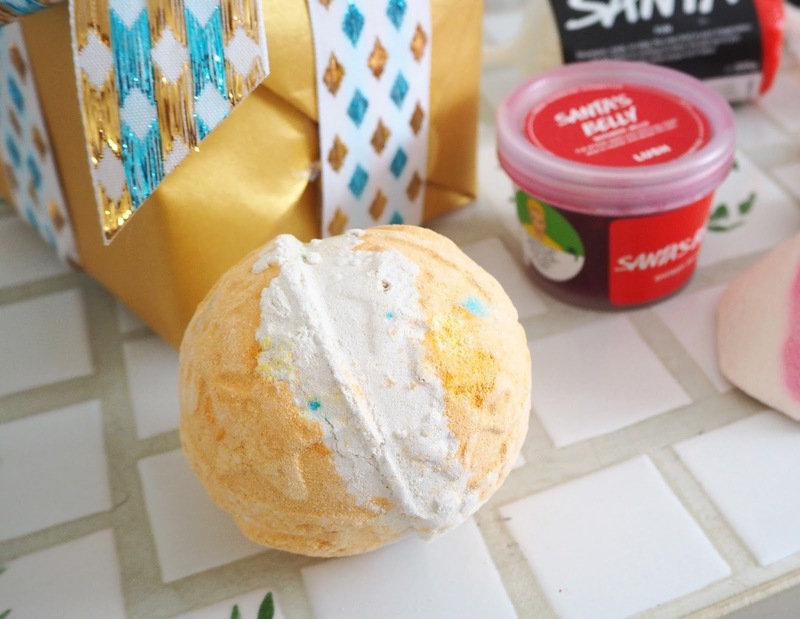 Golden Wonder Gift Set | This set was a Christmas gift and I've loved trying out both of these bath bombs! The Stardust one appears white but actually has a blue core so my bath turned pastel blue which looked beautiful and smelt of vanilla and rosewood. The large Golden Wonder present is shimmery gold and scented with a sparkly cocktail of lime and cognac. 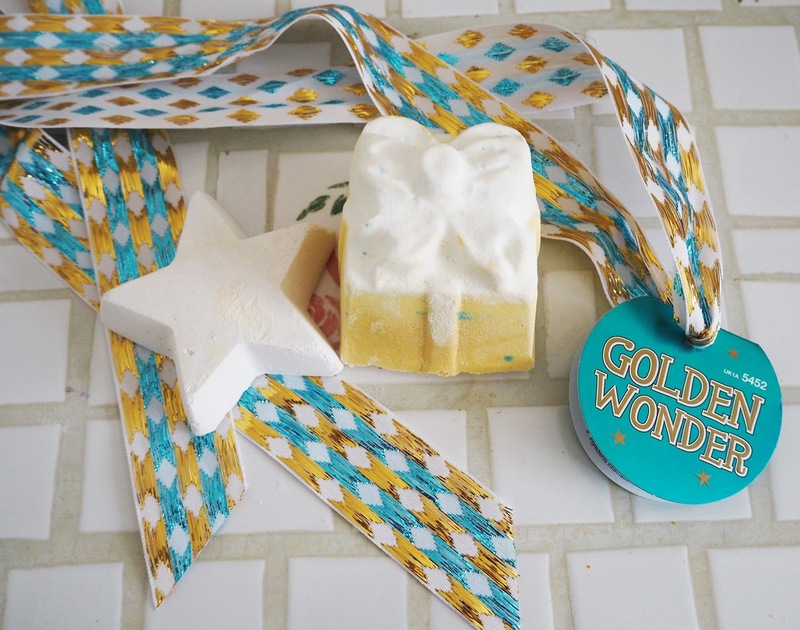 Contains: Golden Wonder Bath Bomb and Stardust Bath Bomb. It’s Christmas Deer Gift Set | How cute is this tin?! I'm planning to use this to store things in, maybe lush soaps or yankee candle wax melts! As soon as I opened it I got hit with the delicious scent of marzipan from the Snowcake Soap. The Star Bubble Bar is so beautiful I want to keep it on display in the bathroom! Overall I'm really pleased with this set, I think it's my favourite one and it was such good value in the sale. Contains: Snowcake Soap, Karma Kream Body Lotion, Beautiful Shower Gel, Golden Wonder Bath Bomb and The Magic of Christmas Bubble Bar. Snow Fairy Castle Gift Set | I'm in love with the scent of Snow Fairy! It smells like bubblegum and candy floss and childhood memories of sweet shops. I know it's Lush's No.1 selling product every Christmas so I was really happy to nab this lovely candy fragranced set. Contains: Snow Fairy Shower Gel, So White Bath Bomb , Fairy Dust Dusting Powder and Magic Wand Bubble Bar. Little Snow Fairy Gift Set | I got this many so I could keep a little stock of snow fairy shower gel plus it was only just over £3 in the sale! Contains: Pink Fun and Snow Fairy Shower Gel. 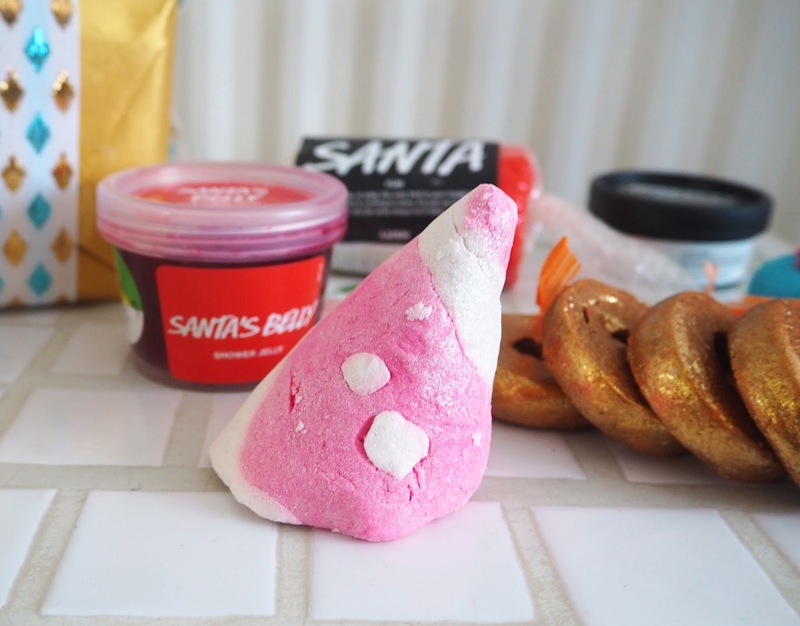 I'm so happy with all the Lush products I bought & received as gifts over Christmas and now have my eye on some of the beauties they have on offer for Valentine's! Did you manage to pick up anything in the sale? Great post. Looks like you got some yummy goodies. I bought the Yog Nog one but haven't used it yet, smells like caramel to me, mmm. 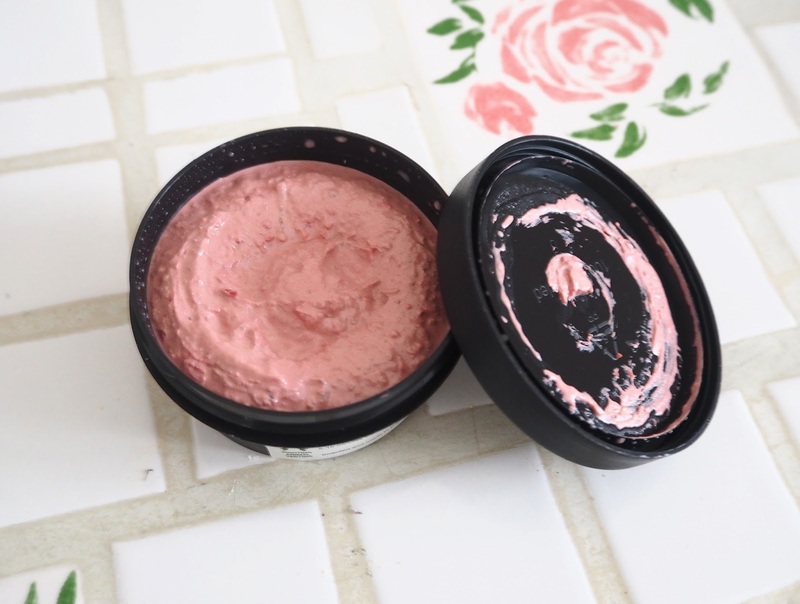 Have you tried the rosy cheeks face mask? It's amazing and smells soooo good and very soothing, leaving skin silky smooth. I got the Valentines lip balm and it smells like sherbet and has a lovely shimmer. Also got the rose bar thing (sorry new to Lush so can't remember the proper name) and can't wait to use it. What valentines items do you have your eye on?